A woman navigates a Chicago street in the Wicker Park neighborhood on Feb. 5, the city’s 34th day of measurable snow. “It has never been this cold.” So said my mother in New Jersey in mid-January. Surely thousands of other Americans had the same complaint in the winter of the polar vortex. 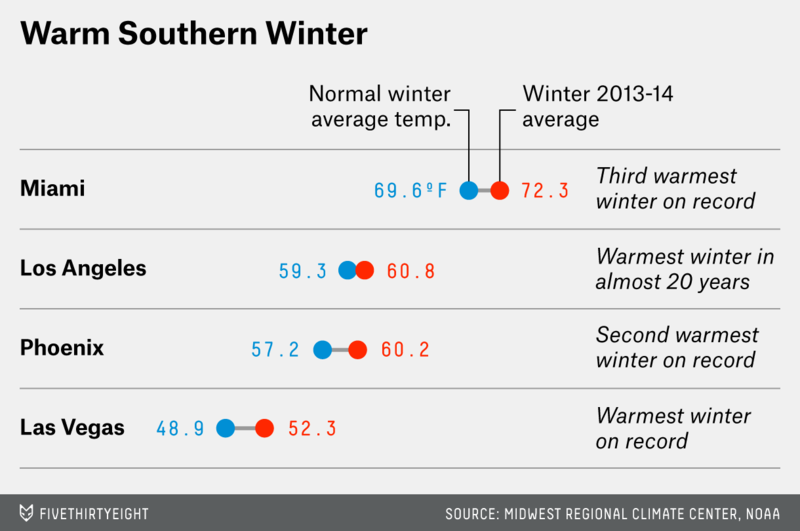 But was this winter really worse than others, or have we gotten soft? With the first day of spring fast approaching, I decided to take a look back. When I talk about winter, I mean the three months between Dec. 1 and Feb. 28. That’s the common definition among meteorologists. Looking at that period keeps data cleanly organized and consistent from year to year. Turns out my mom was right. The winter of 2013-14 brought a rare combination of miseries that many of us hadn’t seen in years, and some had never seen. It was colder than usual, it was extremely cold more often than usual, and it snowed more than usual in more places than usual. Sometimes, weather patterns can be persistent. The dashed black line in this chart1 roughly indicates the dividing line between warm and cold this winter. Note the deep, warm colors over the usually frigid Alaska, eastern Russia and Pacific Northwest coast. Mild air surged over Alaska and western Canada (this winter was Anchorage’s 15th warmest since 1917). The cold that normally settles in those places needed to go somewhere, and this winter it frequently traveled to eastern Canada and the eastern U.S. Most statistics cite the winter of 1978-79 as the coldest in U.S. history. While it was exceptionally cold in many eastern areas this winter, the cold in ‘78-’79 expanded over a larger part of the West, so that year still holds the record. 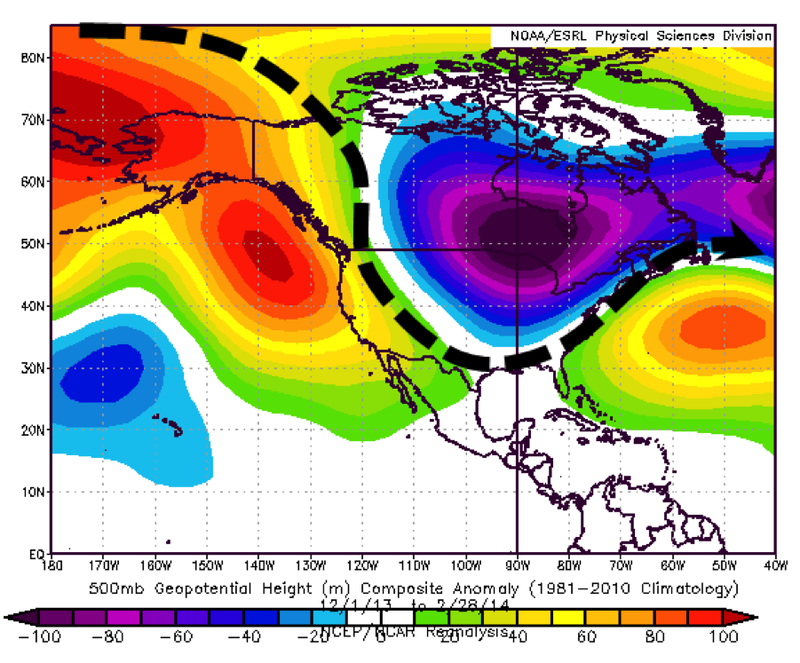 Much of the West was influenced by persistent weather this winter. Downtown Los Angeles was warm and, as you may have heard, it was dry. Three inches of rain at the very end of February took L.A. from the driest winter ever to the 24th driest. But the persistent, long-term Western drought helped make it historically warm in much of the Southwest. South Florida was also predictably cozy. Duluth, Minn., had the coldest winter in anyone’s lifetime. The average temperature of 3.8°F placed second all time, behind the winter of 1874-75 (3.7°F). Minneapolis finished with an average temperature of 9.7°F this winter, its ninth coldest ever and coldest since 1978-79. The number of subzero low temperatures in December, January and February — 47 — was the fourth most all time and the most since the 1930s. Chicago finished with its third coldest (18.8°F) and third snowiest (67.4 inches) winter of all-time, according to the National Weather Service. The city saw 22 nights of subzero lows, which was the fourth-most all-time and the most since the 1960s. Detroit finished with its eighth coldest (20.9°F) and second snowiest (83.8 inches) winter. The Motor City also saw 13 subzero days this winter (tying for seventh most ever and the most since the early ’80s). New York City had an average temperature of 33°F. This only ranks as the 21st coldest winter of all time and the coldest since way back in … 2010-11. Boston had its 52nd coldest winter, averaging 29.9°F, the coldest since 2003-04. Philadelphia did slightly worse with its 46th coldest winter and an average temperature of 33°F, also the coldest since only 2010-11. But those are just averages. 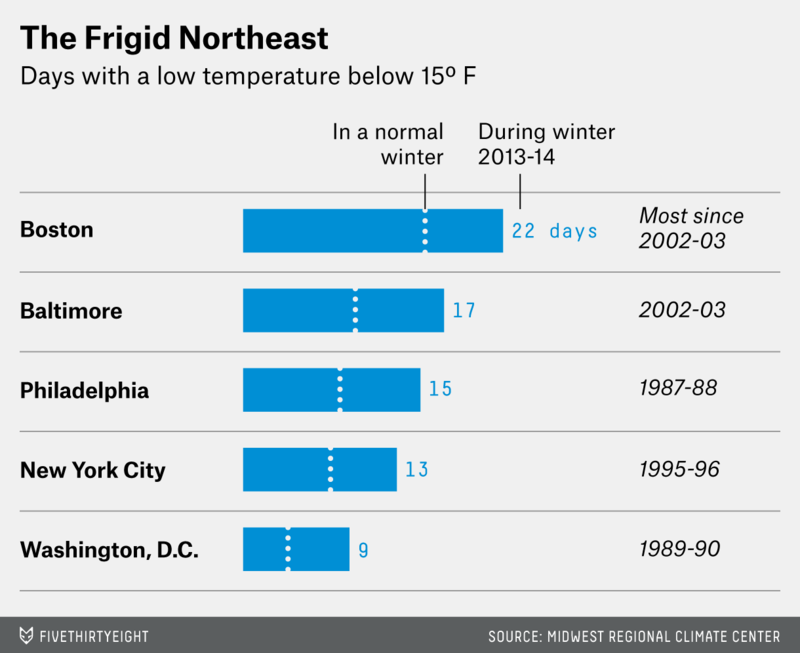 Let’s see how many times the Northeast Corridor dropped to 15°F or less. What this tells us is that when it got cold, it got cold. From Boston to Washington, D.C., most places registered the most days with temperatures 15°F or lower in more than a decade. The average temperature may not have set records in the Northeast Corridor this winter, but the intensity of the cold when it did hit was impressive. Traditionally, big snow winters occur in a couple regions. The East Coast might have great snows, while the Midwest is quiet. For example, Chicago’s five snowiest winters rank respectively as the 93rd, fifth, 38th, 28th and 25th snowiest winters in Boston. Snowfall this winter didn’t discriminate; it blanketed just about everybody (outside the dry West and icier Mid-South). 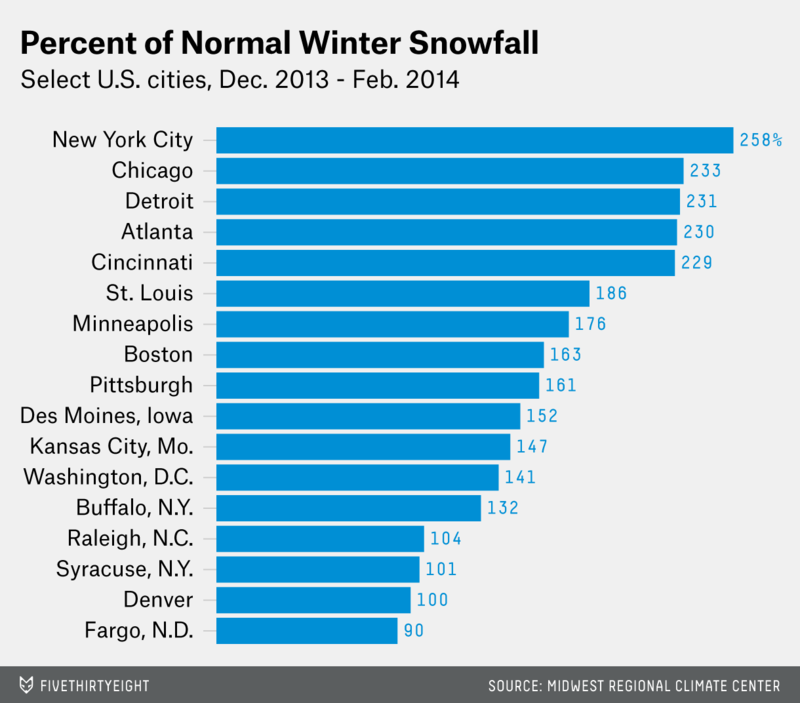 Look how many cities had not just a little more, but way more, than their normal snowfall. 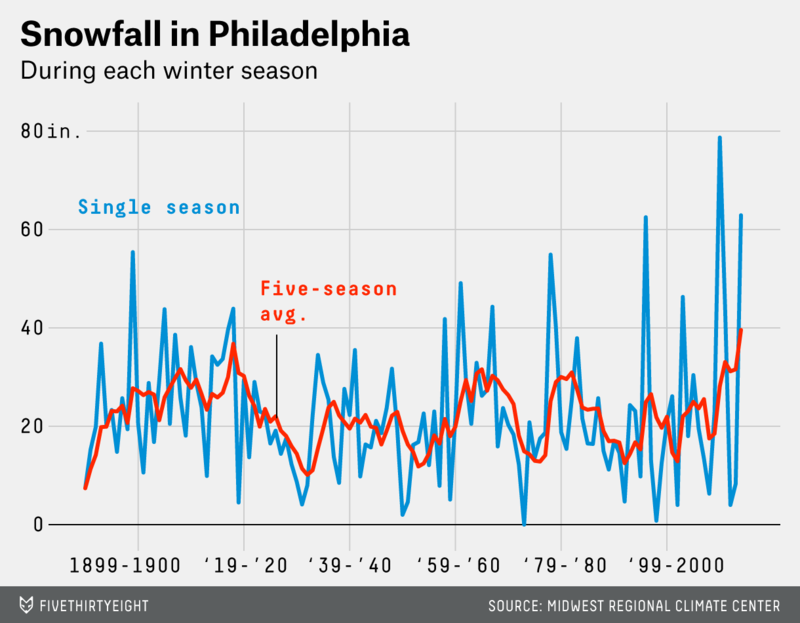 The snow in Philadelphia this winter, and over the last half-decade, deserves a chart of its own. After two relatively snow-free winter seasons, this winter picked right up where 2009-10 and 2010-11 left off. The city has never had a 5-year period this snowy (averaging almost 40 inches per season). In nearby New Jersey, my mom spent the winter shivering and digging out. “Is this the last of it?” she’s asked me almost every time we’ve spoken. Hard to say, Mom. But I can tell you for sure that Arizona is nice in January. From the National Oceanic Atmospheric Association’s Earth System Research Laboratory.